Tuscan Blue Rosemary (r. officinalis 'tuscan blue') - Nice culinary rosemary variety, upright habit, medium/compact fairly tight growth makes this a nice rosemary for hedges and topiary. Medium/mild rosemary flavor. Large blue flowers when in bloom. Perennial zones 8-10. Live starter plant in 3" container. My plant arrived very fast and in great condition. It now lives in a 3 gallon root pouch, and has about 2 inches of new growth 4 weeks after arrival. This one will live in the pot. I plan to take some clones, as I need a whole hedge of this plant. Those will go into the ground when ready. I will post again at the end of the summer. 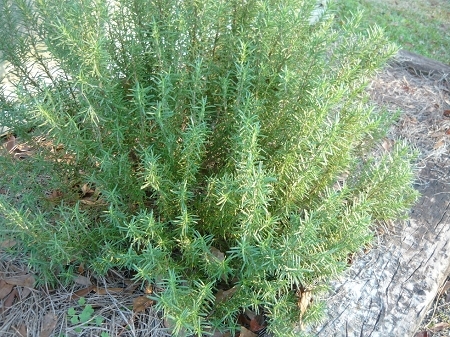 I have read that this is the go-to rosemary variety for culinary uses. That makes a lot of sense; it is very flavorful but not pervading and is a sturdy plant. The shipping was very fast as well.